When Price and I were first dating he was working at a place close to Chinatown and we would often meet for lunch in there. We would often go to Chau Chow City down the road from his office. I would always get their “String Bean Szechuan Style” dish. A spicy dish that is so large that it would make up 2 lunches for me. 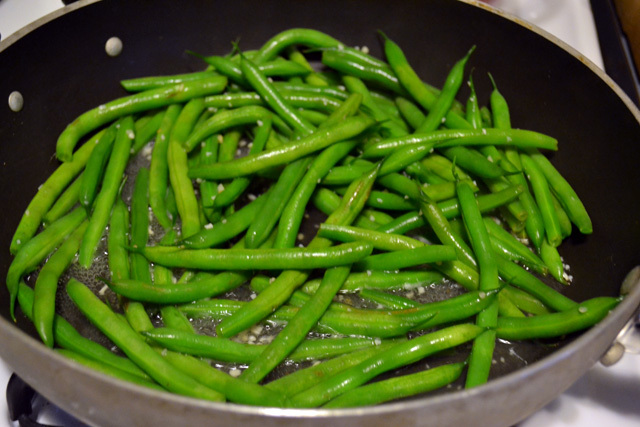 String beans are one of my favorite vegetables so an entire dish centered around them was an obvious winner. And that is why I loved this recipe for Secret Recipe Club this month. This month I was given Yasmeen’s blog called Wandering Spice. What I loved most about her blos is that she paired a song with each recipe. I think that is adorable. Yasmeen makes such interesting recipes that it was so hard to pick from. It sounds corny but I could see myself making most of them in the summer. I just equate flavorful spicey food for the summer. Strange… I know! So I’m sure I’ll be whipping up something like her lentil + fresh basil orzotto or her Chicken + Phyllo “Ladies Fingers”. I have not really explored cooking with lentils before , although I keep buying bags of them to stack up in the cabinet, so her recipes will definitely help me learn. 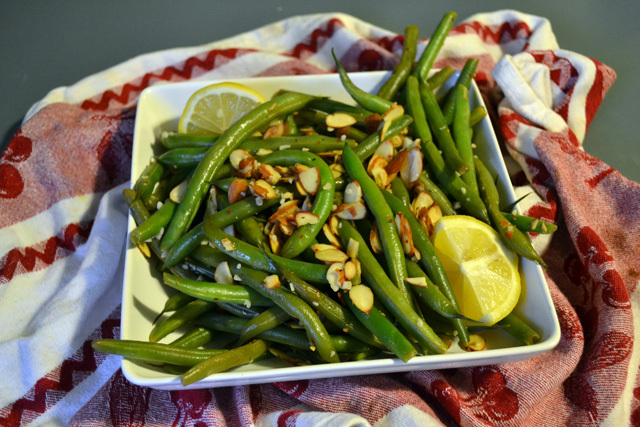 Yasmeen posted a simple Sauteed String Beans with Lemon and Almonds recipe around Thanksgiving and I was hooked once I saw it. 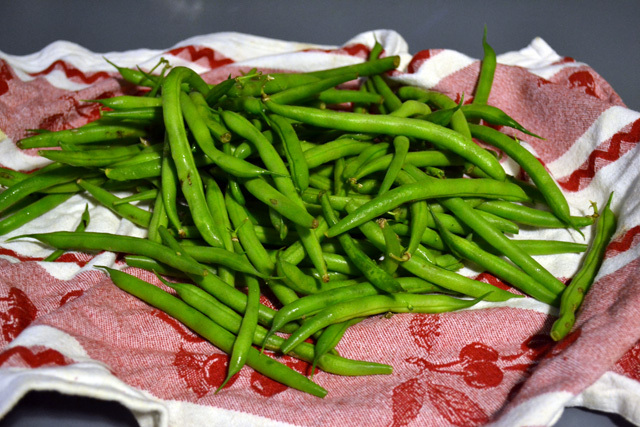 I know that string beans are often associated with Thanksgiving but I think that they should be made more often. As long as they are not viciously overcooked and mushy. Please don’t do that to this lovely bean. And with this recipe you won’t do that since it’s quick cooking and very flavorful. Warm a large skillet over low heat. 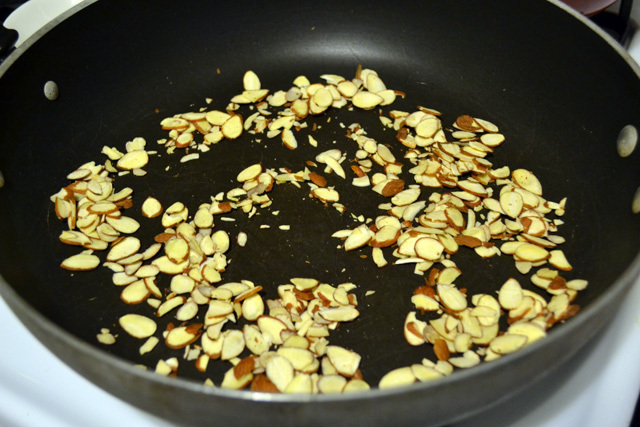 Gently toast the almond until they are aromatic and light brown, around 2-3 minutes. Remove from skillet and set aside. Wash and trim the cut ends of the beans. Turn the heat up for the beans. 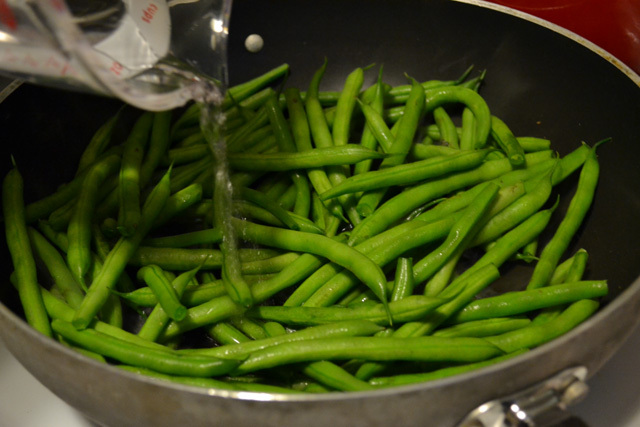 Once the skillet has gotten hot again,add the green beans and 1/4 cup water. Cover the skillet and let steam 2-3 minutes, until beans are just tender. Add the minced garlic, lemon juice, salt and pepper, red pepper flake, and rice vinegar to the beans. Sauté for a 1-2 minutes, until flavours combine and beans are tender (but still crisp). 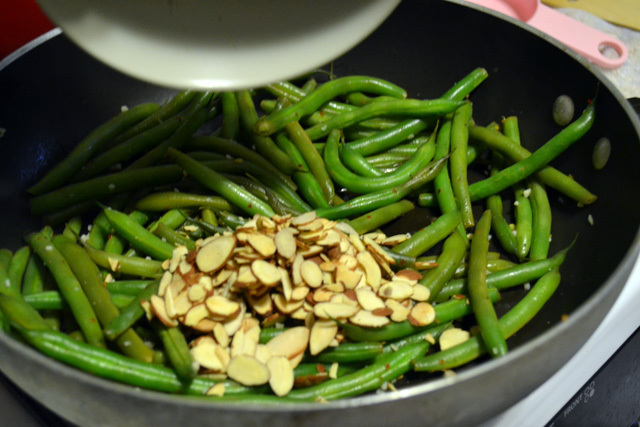 Once done toss in the toasted almonds and dress lightly with olive oil.